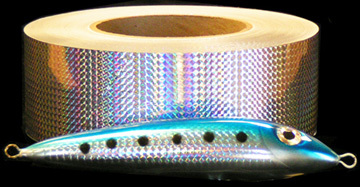 COLOR-SHIFTING & HOLOGRAPHIC FILMS for FISHING LURES and CRAFTS - These brilliant, color-shifting hologaphic films are available for crafters and fish lure makers who want to cut large designs and shapes for fish lures & flashers. They are also great for many crafts, signs, decorations, scrap books, and other applications. They can be used in computerized vinyl-cutting machines to create designs and shapes for various kinds of lures. These films all have an outdoor rated, waterproof adhesive that is backed with a removable paper liner. They are not stretchy.